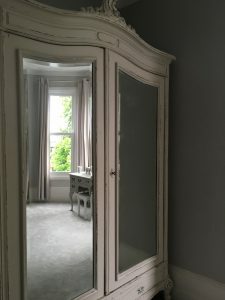 This is my post about how to upcycle mirrors. If you can’t see the video, click here. A lot of people take the Mickey out of me for how many mirrors I have in my house. I do love a good mirror, it’s true, but trust me it’s not about looking in it but at it. Innit. I have counted 20 mirrors in my house. I know ridiculous, right? I won’t go through each and every one but I want to show you how you can pick one up for next to nothing and make a feature of it relatively easily. I feel mirrors have magical powers and can absolutely transform a room. The wrong one can completely destroy one too though, so use the power wisely my friend. We all know they bring in more light, make a room seem larger and give you the opportunity to see people pulling faces behind your back. What some fail to see is that if you get the looking glass just right you can totally set the tone of that room. Get it wrong though and it doesn’t matter how gorgeous the rest of it all is, that one item is going to reflect badly on you. I’m not apologising for the use of puns in this blog by the way, so deal with it. 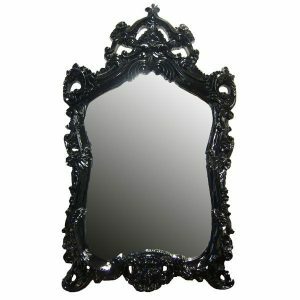 There’s no getting away with a substandard mirror as we are drawn to them when we enter a room – like a window. 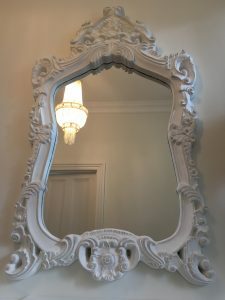 Frameless mirrors and those with plain frames have their place with certain looks, but for the purpose of this blog I’m going to focus on turning gaudy framed wronguns into gorgeous ornate stunners. Now I’m going to be a bit backwards here and show you some ‘afters’ followed by the ‘befores’. I want you to see the mirrors around my house how they look now before I show you where they started their little lives – in case you prejudge them. If you have seen my Kardashian blog from last week, you may have liked their oversized, rather blingy piece. They need the larger version for when Kim comes round to check out her rear view. I know I know. 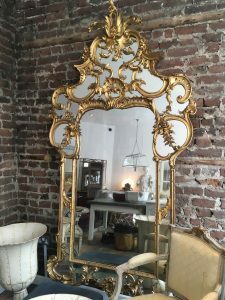 Of course we expect a large, highly embellished mirror to cost a pretty penny. Check out, for example, this Italian gold number from a shop in Kent’s Sandgate – a glass shattering £5k. To be fair you need a lot of wall to get away with this, but trust me you don’t need equally deep pockets. If you wanted a slightly more modest version, check out the one by my front door. By the way this position of mirror is a must for any self-respecting person who doesn’t want to be caught answering the door with half a face made up because she was interrupted by a baby trying to put makeup on a cat. That’s a true, very ‘Clockwork Orange’ story. These ones in my gym I bought and up-cycled because I wanted to bring together the matching fire surrounds. 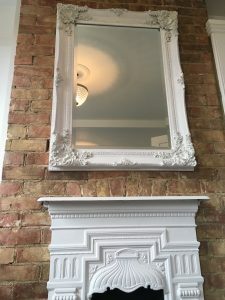 My tall husband and I have had a war of the mirrors every house we’ve decorated, as a mirror that suits my height is only good for him to comb his tuft of chest hair in front of. So I have a habit of making a feature of lots of mirrors in the bathroom to keep us both happy. In the current one, we have three. This one on the chimney-breast I bought second hand for £100 a few years ago. These two were in the sale at Zara Home. 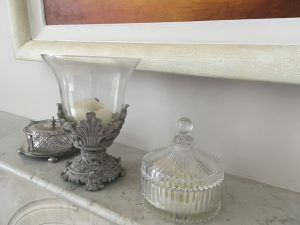 They really bring the room together, and add character – and stop my hubby and I arguing. Please note the ones above the basins are the perfect position for normal height people and, although there are ‘his and hers’ basins, no one in their right mind would have put these at odd heights so ‘he’ could see his reflection without crouching…there you go, argument won. I love the one in our bedroom as it has a real tale to tell. It’s not only an interesting shape, but also has aged glass spots. 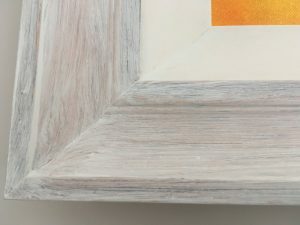 Now this cost very little but I wanted the frame to look a little brighter so I just used a single coat of Annie Sloane Pure chalk paint to freshen it up and bring it in line with the bedroom’s grey and white colour scheme. The two mirrors in the gym can still be picked up like this. Now actually if you have a scheme that can take gold, these are an incredible price from Dunelm and all you need do is hang them. I’m off gold at the moment though, and I loved the design of these, and of course the price tag. So all I did was use chalk paint to bring it in line with the more subtle palette of my house. I only used one coat as I wanted the gold to come through slightly to give it another dimension. The one that is really a transformation though is the hall mirror. Now this gaudy number was also tens of pounds from Dunelm and this is how it spent its youth. Now this took slightly more work. 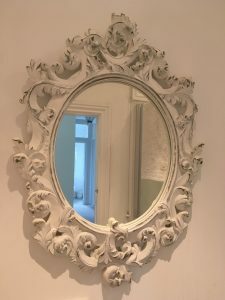 It’s pretty plasticky so takes at least three coats of chalk paint to enable the mirror to forget its ugly duckling past. 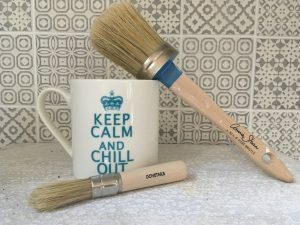 I mainly use Annie Sloan brushes and paint by the way. To really help it embrace its adult life as a sophisticated swan I used a dry brush effect with grey just to bring out the swirls. You don’t really notice that grey is on there, but what it does is just prevents it from looking too flat. It doesn’t need to be grey, you could use a paint that fits the colours in your room, but just remember that less is more. Start with a very small amount on the end of your brush (I used a stencil brush from Dovetails for this) and remember if you want more you can add it later, but it’s harder to erase if you are heavy handed from the start. 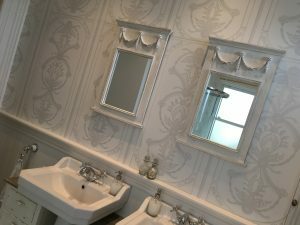 No need to mask the mirror by the way, a simple baby wipe will do the job, or just a scraper to remove the splashes – make sure it’s not damaged in any way though or it could scratch the glass – obviously. Unless it’s in a high traffic area and open to the abuse of sticky fingers there’s no need to finish it with a wax or anything. To me it’s the beautiful chalkiness that really gives it the edge. Wear gloves to hang it though. 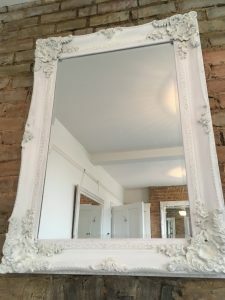 One more tip…prop the mirror up when painting it using tins of paint on a small table you don’t have to lean across to prevent serious back ache. 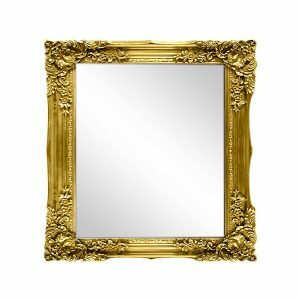 Why stop at mirror frames? 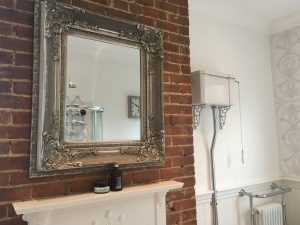 Now I’ve focused on mirrors for this blog, but I’ve also gone a little crazy removing any trace of gold (which I may be loving in six month’s time!) 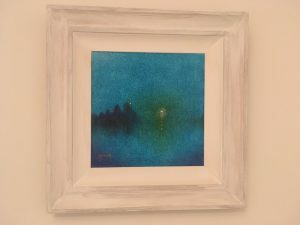 and have, in my opinion, given my husband’s art collection a new lease of life by painting all the frames that were supposedly ‘chosen by the artist’ – we all know that’s not true. Now when he came home one day and found his precious babies on the floor in the dining room, next to a whole load of paint, I think it’s fair to say it wasn’t one of the highlights of being married to his angel of thrift (bearing in mind I was saving us hundreds if not thousands of pounds of the cost of having these reframed). He has now dropped the divorce proceedings though and has even muttered that they do look better. I think that’s what he muttered anyway. 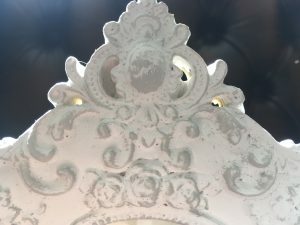 So in my vlog to accompany this, I am going to show you step-by-step how to paint picture frames in the same way, using some intricate, but formerly slightly tacky frames my mum bought me for Christmas with the intention of me having something other than the family heirlooms to paint. 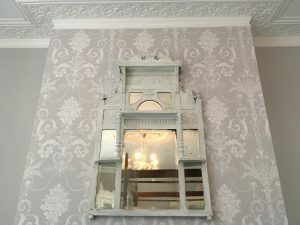 Hopefully this ‘how to’ video will you get you in the right frame of mind to reflect on what could be improved on your walls. Yes that really is how I’m finishing this blog. Loved the tip on the tiny bit of grey. I have a habit of over doing colours and end up with a flat hue to everything then splodge white on to try and highlight and end up with a mess. Your method is so simple but when risk – thank you! Thanks so much for taking the time to comment Valerie. Well the great thing with chalk paint is that if you overdo something you can go over with the white and start again. To save time though just be really conservative with the brushing on colour as you can always add more. I love this effect as it’s so subtle and sophisticated. Worth experimenting with other colours too as you could always brush on a lighter colour to a darker one too – that can look gorgeous.